These modern all-in-one pusher arms are easy to use, and don't require any assembly or disassembly. This matching set of 4 modern pushers is available in an attractive clear yellow color scheme. The combination of rack and pusher allows walls to be pushed out without any fuss, as well as keeping your hand well hidden. 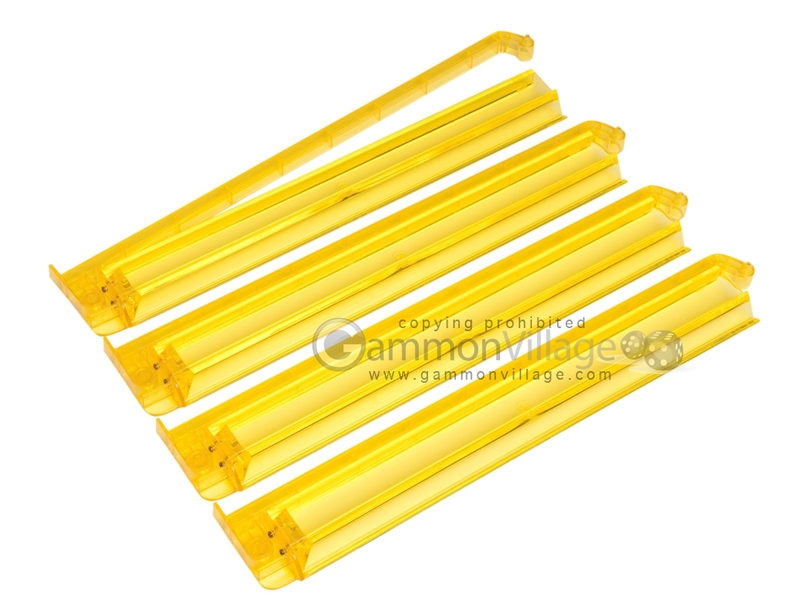 Made out of sturdy acrylic, these modern mahjong pushers are high quality, and will give you years of lasting enjoyment. Please click on the specifications tab (above) for more information about these modern mahjong pushers, and click on the photo for an enlargement. Length: 16" Width: 3 1/4" Height: 1"
Page P5161 Copyright © 1999-2019 GammonVillage Inc., USA. All rights reserved.